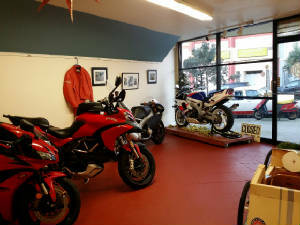 Our locally owned small business has been around for almost 2 years, supporting the motorcycle community with maintenance, tune-ups and workshops. We are a family owned company, run by the husband and wife team of Michael and Christine Carion. Michael has been a self-admitted gear head since he built his first bicycle at age 12. He has been riding the Bay Area roads for over 25 years and takes every opportunity to be out on the road, family and work permitting. We currently own a stable of 4 motorcycles and 2 scooters - which brought about our latest venture with our new Balboa Street storage facility. Christine is our business manager and keeps us running smoothly. She has over 10 years experience running complex business programs in the high tech industry and oversees all the necessary operational details. Her organizational and business skills make her a great partner for our motorsports subject matter expert, Michael. To find out how we love to spend our free time, please check us out at our Calspeed Moto MeetUp group!